1) Mix all the ingredients (2-8) in bowl. 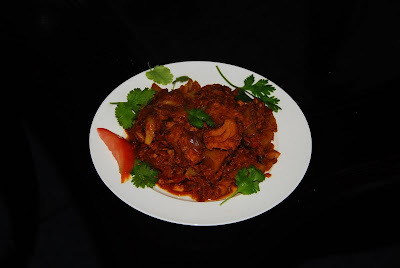 2) Mix the masala with the Fish pieces properly.Keep the marinated fish pieces for half an hour. 3) Heat 2 tsp oil in a pan, add the Fish pieces into it. Allow the Fish pieces to turn brown,let both sides of the pieces turn brown equally. Fry the pieces properly. :- Serve the dish when it is hot. Fish fry will go fine with Rice,Chappathi,Porotta. 17) Salt – to taste. 1) Heat the oil in a pan. Add mustard seeds ,allow it to splutter. 2) Add the Sliced Onions,sliced shallots and sliced green chillies to it and allot it to turn brown. 3) Mix Ginger/Garlic Paste,Green chillis,Grated Cocconut,turmeric powder,cumin seeds,chilli powder,Corriander Powder into it. 4) Stir it for 5 mins till it get rid of the raw smell. 5) Add the tin fish after draining the water in the tin, also add the Cooked potato pieces. 6) Add seasoning salt,Cilantros,Salt and Garam Masala Powder. 7) Stir well and Close the pan for about 10 to 20 minutes,till the fish is cooked well. :- Serve the dish after garnishing with Cilantros. 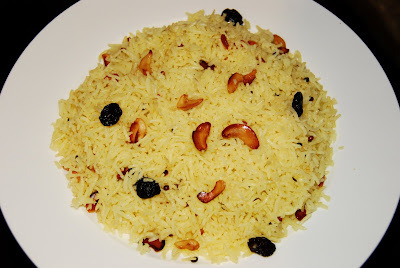 This dish will go fine with Rice,Bread,Chappathi,Porotta. 1)Wash and soak rice,Black Gram,Dal separately for few hours. 2)Grind Raw rice, dal,black gram and cooked Rice adding required quantity of water. 3)Add salt to taste ,stir well to form a loose batter. 4)Keep it overnight to ferment. 5)Pour one spoon full of batter on a greased idilli pan . 6)Allow it to cook well for about 10-20 mins. 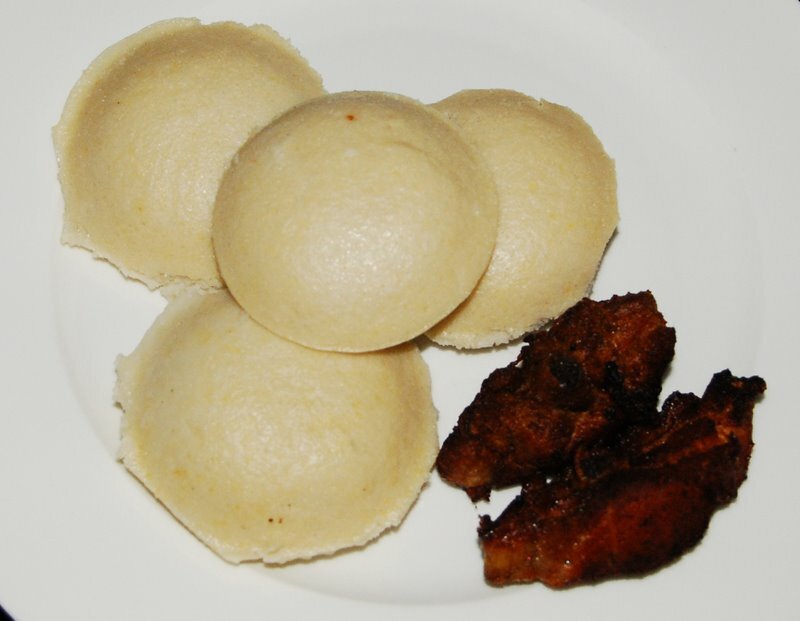 Check whether the idilli is cooked by inserting a thin knife or with a tooth pick. :- Idilli is ready to serve if it is all set. Serve it hot with Chutneys ,Sambar,Chicken Curry,Chicken Fry or with Potato Chutney. 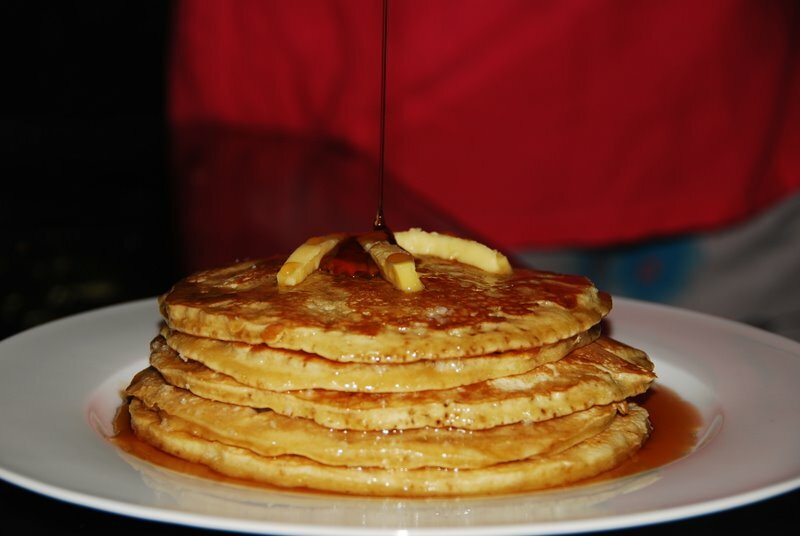 5)Pour one spoon full of batter on a greased frying pan as thin as possible. 6)Pour 1 tsp of oil on its edges.When the base is golden brown, turn the side and cook well. 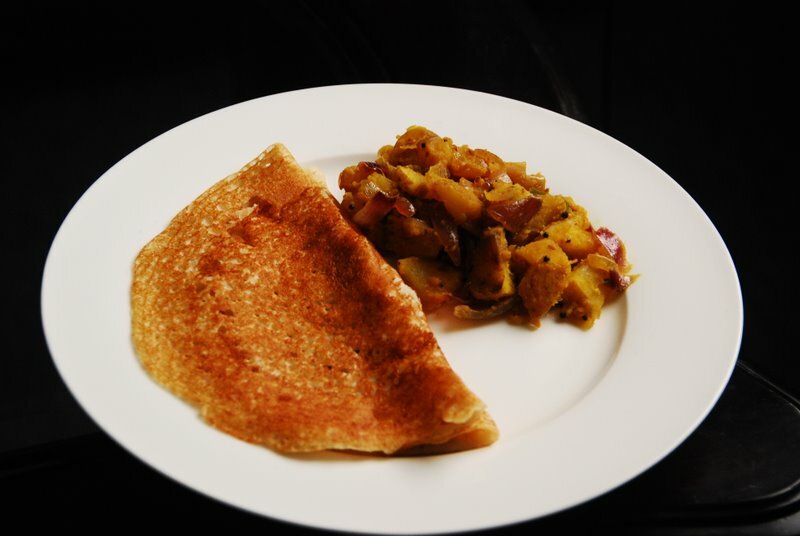 :- Dosa is ready to serve. Serve it hot with Chutneys ,Sambar or with Potato Chutney. 1) Cook the Green gram for about 2 whistles in a pressure cooker, cook almost 3/4th. 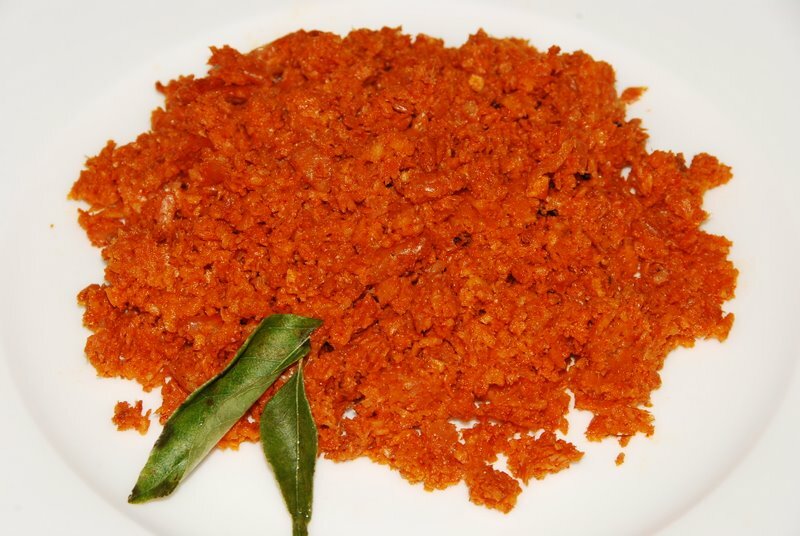 2) Grind the Grated coconut, Shallots, garlic, ginger,Cumin Seeds,Green chillies and salt. 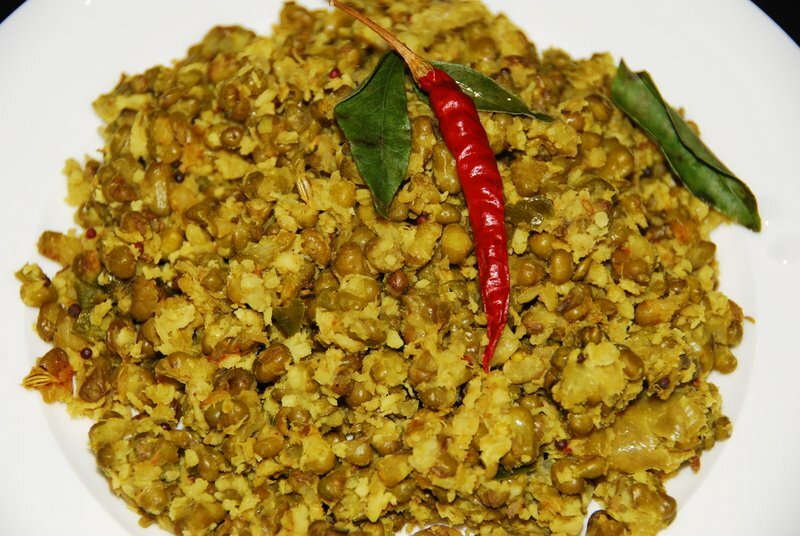 3) Add the grinded mixture to the cooked green gram. Stir it well and simmer it for 5 to 10 minutes. 4)Heat oil in a pan.Add mustard seeds and allow it to splutter. 5)Add some chopped Shallots ana allow it to turn golden brown. 6) Add the chilly powder to it. 7) Add the cooked gram mixture to it and Stir it well till the water content evapourates and seems to be dry. This dish will go fine with Rice. :- Serve it hot after garnishing with Curry Leaves. 1)Clean the dried prawns carefully to remove dirt, drain and keep aside. 2)Heat 1 tsp of coconut oil in a pan or a kadai. 3)Fry the prawns until the raw smell disappears. 4)Grind the prawns with the other ingredients nicely into a fine paste. 1) Sift together flour, baking powder, sugar, and salt. 2) In a separate bowl, whisk together the eggs and milk. 3) Add to flour mixture, stirring only until smooth. Blend in melted butter. If the batter seems too thick to pour, add a little more milk or water. 4) Cook on a hot, greased griddle, using about 1/4 cup of batter for each pancake. Cook until bubbly, a little dry around the edges, and lightly browned on the bottom; turn and brown the other side. Serve hot with the Aunt Jemima Syrup. 1) Knead the flour and salt together. 2) Cut 20% of butter into a pan ,stir until butter is melted. Dont allow the rest of the butter to get melted, So keep it in the refrigerator until we use it. 3) Combine flour,salt,vinegar and 20% of the butter and make it into a soft dough. Combine it thouroghly (similar to Chappathi dough).Smash the dough with the roller for about 5 mins to get softened. Keep the dough in the refrigerator for 15 mins. 4) Roll the cold dough into a thick square sheet on floured surface. 5) Keep the rest cold piece of butter in the middle of the sheet and fold it properly. Now make sure that you touch the dough only with your finger, dont allow to transfer your palms temperature to the dough and make the butter melt. 6) Now slowly press the dough with the roller ,dont let the butter to come out of the sheet. 7) Roll dough into a thick rectangular sheet (about 14 x 9 inches) on floured surface. Fold short sides inward to meet in center; fold in half along center where the two sides meet. Lightly flour surface and roll dough out again into about 14 x 9 inches thick rectangle; fold as before. Chill for 15 minutes after each rolling and folding process. Repeat rolling ,folding and chilling process for 6 times. 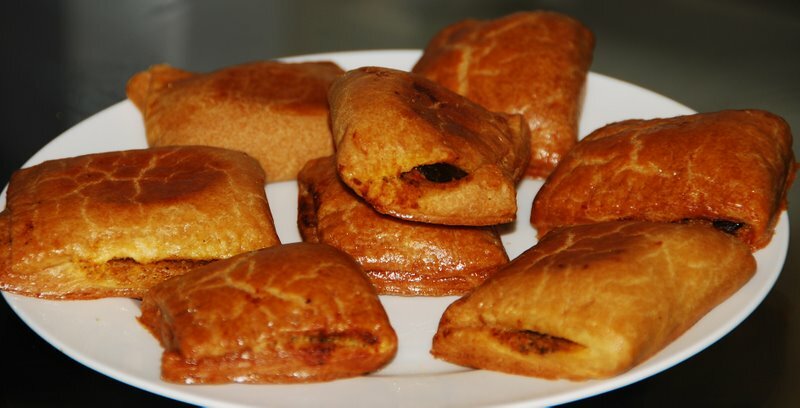 Make sure that the butter is not coming out of sheet.Dont apply too much pressure on the dough. This rolling and folding process is for getting the layers and to make the puffs more and more soft. 1) Cook Sliced pieces of Chicken,Carrot,Potatoes till soft. 2) Heat oil in a pan. 3) Add the Cooked pieces in oil. 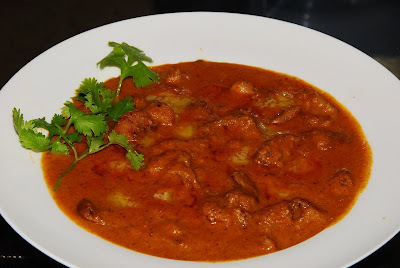 4) Add pepper,salt,lemon juice,garlic pods,chicken masala, garam masala and chilly powder. 5) Fry them for 5 mins on a medium heat. 6) Once it’s done, remove from fire ,grind the mix and keep it aside. 7) Take puffs sheets and roll them a little with the roller. 8) Cut them into 4 X 4 inches, square pieces. 9) Place the stuffing on one half of the sheet. 10) Fold the other remaining half of sheet on the stuffing. 11) Take a little amount of water and close both the ends of the stuffed puffs. Use the fork ends to close the ends of the puffs. 12) Follow the same procedure with the remaining stuffing. 14) Place in the oven at 450 degrees for 10-20 minutes or till light brown and crispy. :- Serve hot with ketchup. Note :- Making the Pastry sheet alone will take about 2 hours. For Easy Puffs you can use Puffs Pastry Sheet which is available in the market and follow the directions of it to have the puffs sheet ready and just stuff the masala mix in it and bake. 1) Wash and soak rice for about thirty minutes. Drain and then boil in plenty of boiling salted water until almost done. Drain and keep aside. 2) Heat oil/ghee in a shallow pan or a kadai. Add a pinch of asafoetida. Add dried red chillies broken into two, Black gram,Cashewnuts,Raisins. Cook until Black gram change colour to light brown. 3) Fry the grated coconut till it turns brown .this is optional. 4) Add mustard seeds. Let mustard seeds crackle, then add curry leaves. Mix turmeric powder in this. Stir fry for a 30sec. Add cooked rice, salt and lemon juice. 5) Garnish with fried grated coconut. Serve it hot with Chicken Curry.